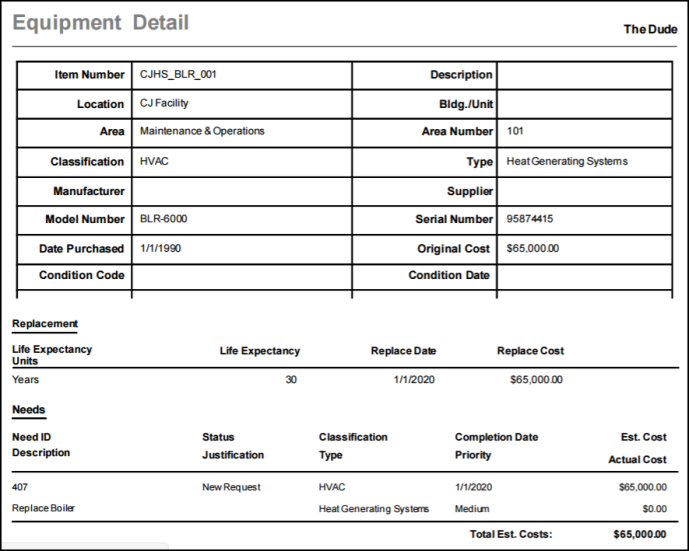 What it does - The Needs Detail is a great way to see estimated costs for needs and any upcoming replacements and renewals all in one report. 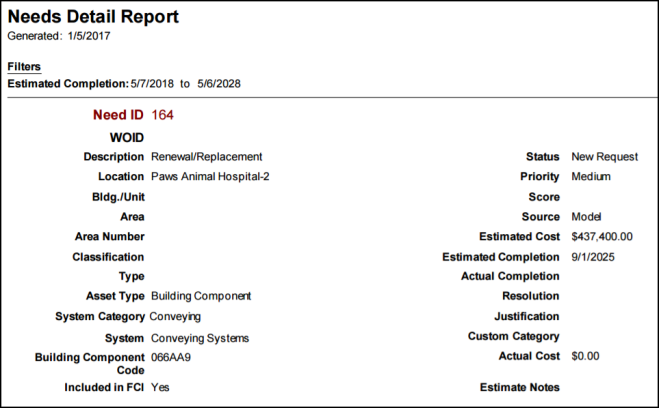 Why it's great - The Needs Detail gives you a "snapshot" of your upcoming renewals and replacements for your building components allowing you to plan accordingly. By utilizing this report, you can set and prepare budgets based on the estimated costs. Click on Report in the Actions menu, and then click on Needs. Enter the criteria in your report, making sure to select Detail in step 24. What it does -The Equipment Detail allows you to view any upcoming replacements for your equipment as well as costs associated with the replacement. You can also view any Needs you have manually created for your equipment. Why it's great - The Equipment Detail is very helpful in showing what equipment will need to be replaced and when. With this report data, you can plan ahead for your replacements. Click on Report in the Actions menu, and then click on Equipment. Enter the criteria for your report, making sure to select Detail in Step 22. 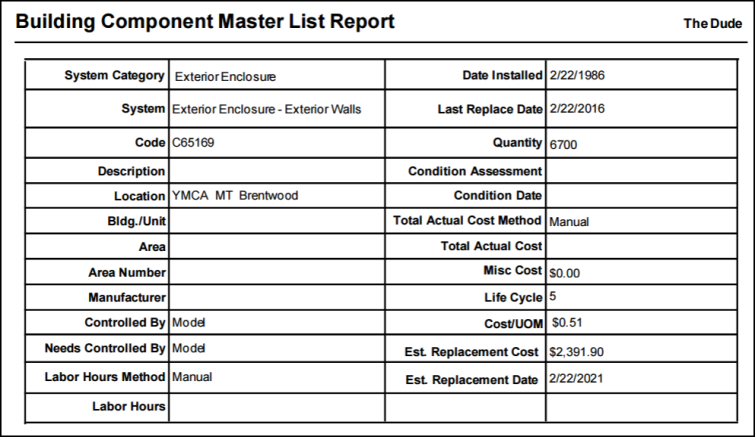 What it does -The Building Component Master List provides information such as Est. Replacement Cost and Est. Replacement Date for all of your existing building components. Why it's great -The Building Component Master List is useful for viewing your building component data and can also be used as a template for imports. The import feature allows you to make multiple changes to Building Components at one time. With the report spreadsheet, you are able to modify certain fields such as Description, Quantity, and Last Replace Date. Once you have updated the necessary information, you can easily import the spreadsheet back into the system to apply the changes to existing Building Component data. Click on Report in the Actions menu, and then select Building Components. Enter the criteria for your report, making sure to select Master List in step 9.